Diamonds are a man’s best friends, too! The Mingus Quintet are stunning speakers: not too big, not too small, certainly room-dominating, but their class is immediately evident at first gaze. 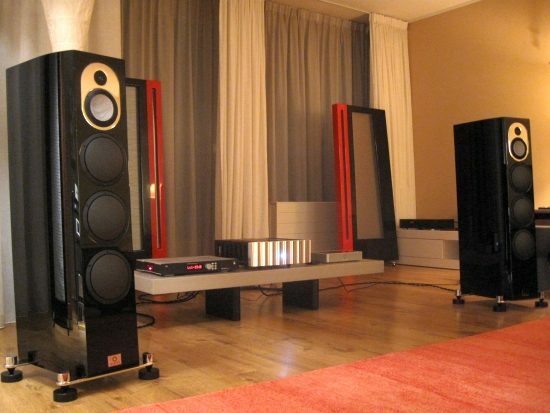 These pieces of luxury are in my listening room because I felt that it was time to explore what was out there in dynamic speaker land, so without taking electrostatics or magnetostats into consideration. 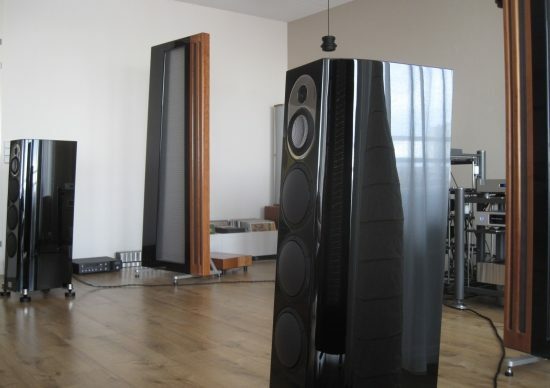 For the longest time I have stuck with dipole planar speakers mainly because of their midrange and treble performance. 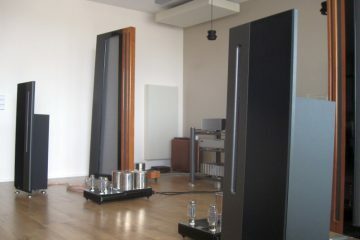 There just did not seem to be any dynamic speakers that could sound as sensuously free and refined as these designs. Although I am still very much in love with my full range Apogee Acoustics ribbon speakers, I heard some dynamic speakers at the Enosound show recently that did make me pause. That was the trigger for me to ask Hans van Put of HVP Audio to supply a set of Marten speakers for review. Hans was kind enough to also supply the Jeff Rowland 625 s2 and a small assortment of Jorma cables. 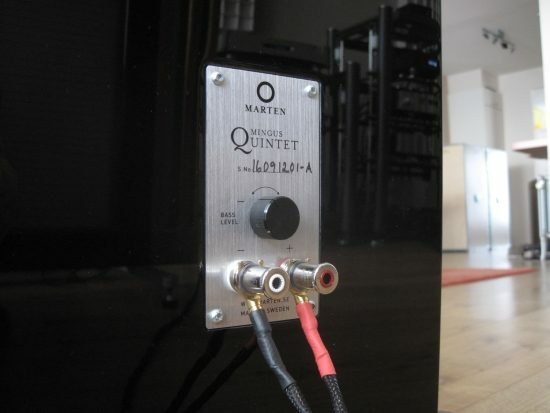 The Mingus Quintet are the result of Marten’s desire to produce speakers with quality similar to the Coltrane 2 and 3, in a more affordable price range. 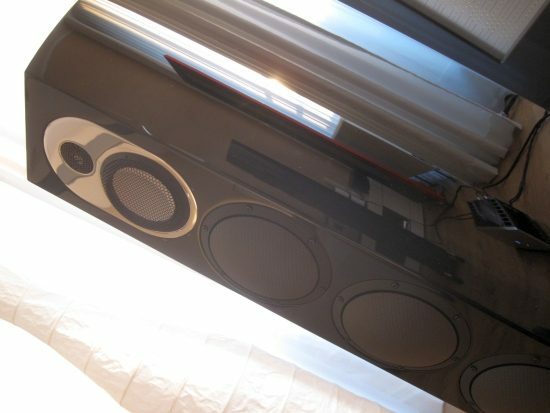 To this end a smaller enclosure was used made of wood, rather than the nicely curvy carbon fiber and instead of the two 10 inch woofers, three 7 inch woofers are employed. 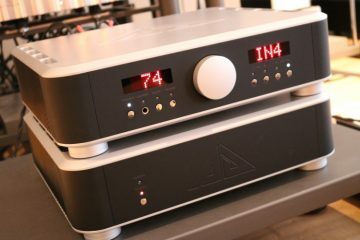 The tweeter and midrange units are even exactly the same as those used for the Coltrane 2. Visually especially nice at are the woofers with their subtly convex cone, made from an aluminium honeycomb sandwich that protudes forward rather than inward, to make for a very clean look. These speakers are designed to have vanishingly low levels of distortion, they have an incredible frequency range: 24-100000 Hz +-2dB and they go plenty loud. Power amp used was a Jeff Rowland 625 s2, the same as Hans uses with the Coltrane 3’s himself. 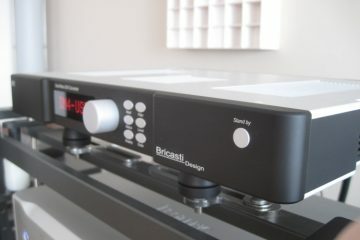 A preamp was left out and instead two DACs with variable volume were used: the Exogal Comet and the Bricasti M1. Cables used were Jorma Origo and Cardas Clear. Sources were the Aurender N10, EC Designs BeagleBone Black and Euphony Buggy/Zotac. 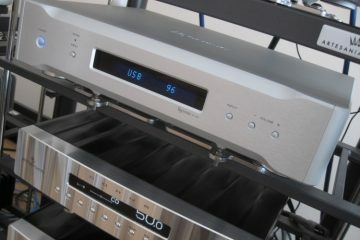 I also listened to the speakers using my own Jeff Rowland model 6 power amps. 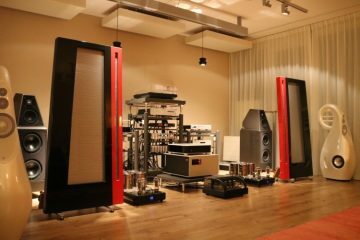 While this sounded highly refined with no apparent power shortage, the 625 s2 provided better pacing, more transparency and a more lively sound. Initial listening was done with the Martens in front of the Divas and my main system, but a better position was found when rotating the setup 90 degrees, which resulted in cleaner bass and an overall more even handed sound, and this was how the speakers were used for the remainder of the review. 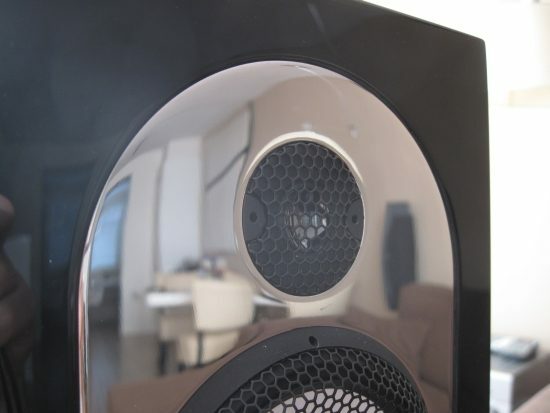 The speaker crossover is entirely first order which according to the maker provides perfect time and phase coherence. 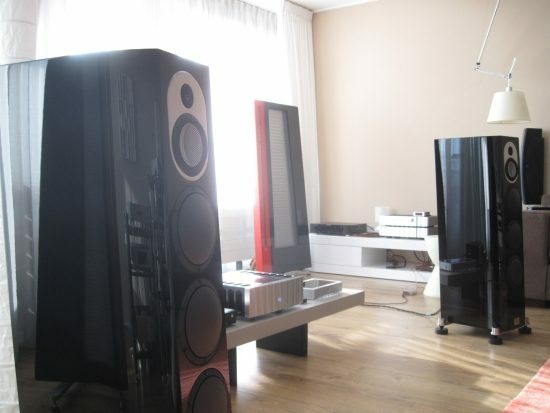 Indeed the first thing you notice when listening to these speakers is how incredibly coherent they sound. As I listen to full range dipole ribbon speakers in the shape of Apogee Diva and Apogee Duetta Signature on a daily basis I am quite used to box-less sound and since the Divas produce the majority of the frequency range (550hz -10khz) with a single ribbon, I am especially used to hearing no phase shifts in the midrange. When listening to dynamic multi driver speakers I am usually very much aware of the transitions between the drivers, and more so the influences of the crossovers, especially in the midrange, where oftentimes there is some phasey smear that I find quite distracting. None of this is evident when listening to the Mingus Quintet. Speed is great, as is dynamic impact, and articulation is simply fantastic. The marriage between bass and midrange is very good, but the marriage between midrange and tweeter is really spectacular, the two units truly sounding as one driver. 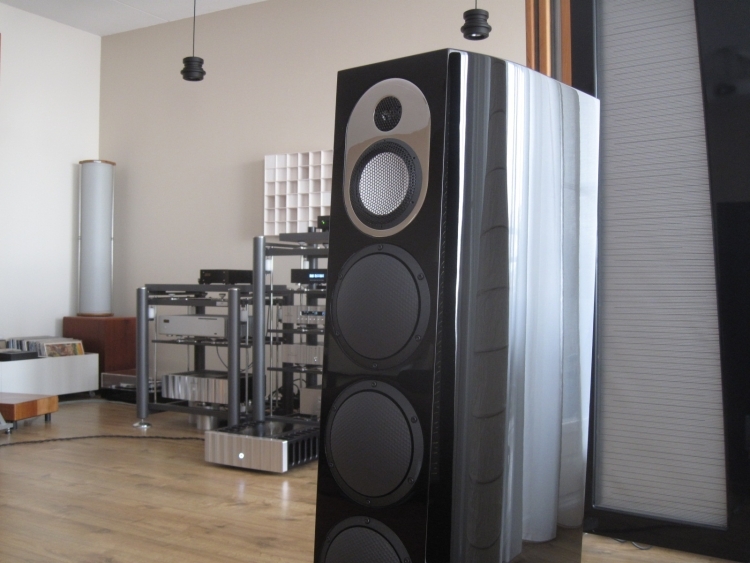 Treble is mesmerizingly expressive and impressive, yet these speakers never sound in your face, let alone harsh. There is no spit and no harshness, not even with lesser recordings. 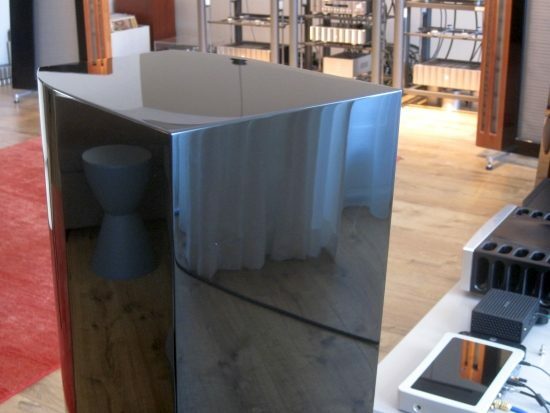 The sound is not thrown forward, rather it extends all the way to the rear side of the room between and behind the speakers. I am quite sensitive to tweeter edge and harshness but the Mingus Quintet’s Diamond tweeter exhibits none of the irregularities that I hear so often with dynamic speakers. 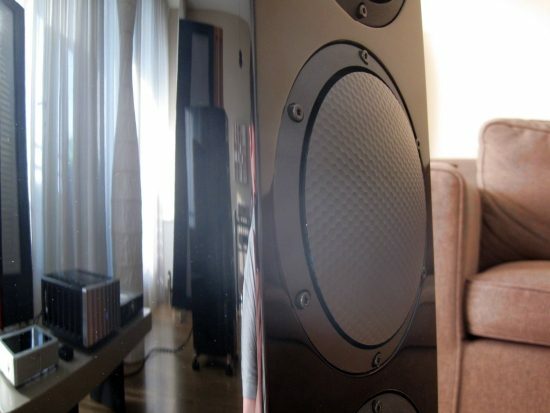 Rather, this speaker’s treble is sweet, smooth and extended and very, very agile. Transient behaviour is incredible and it is with this speaker that for the first time I hear treble being both smooth and fluid, as well as incredibly dynamic. 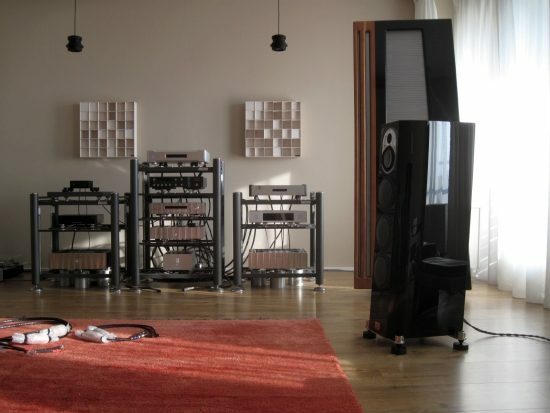 Plenty speakers have very dynamic and/or very open treble but it is almost always also quite edgy. This is then sold with the excuse that live sound can also sound harsh. This is something that I have never agreed with. While live trumpets and other instruments can sure sound very loud and ear-piercing, they never exhibit the glassiness or edge that some tweeters happily produce. I never thought it could be possible, but these speakers’ midrange and treble performance is easily a match for the full range Apogee Divas, or any ribbon speakers that I have heard. These speakers also excell in sounding lyrical, an expression I use to indicate a “singing”, emotionally appealing effect. Timbre is superbly natural and convincing. 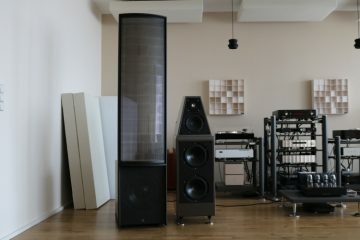 Short of the Apogees (that do not have cabinets) I have not heard such cabinet resonance-free midrange and treble, let alone from dynamic drivers. 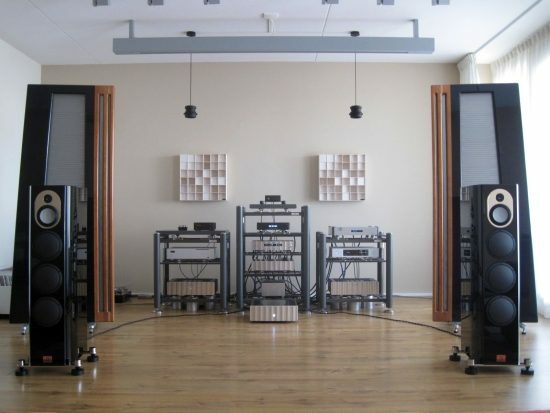 Voices and real instruments are superbly convincing in timbre as well as size. The sound in the midrange and treble is so very pure, so real and the resolution so incredibly high that I would describe it as really human. Soundstaging with these speakers is really fascinating. Although they don’t sound inherently big, they definitely do image well outside of the speaker enclosures, as long as this is in the recording. Also the sound does not come from the speakers but exists in a bubble around them, the enclosures all but disappear. It’s in between the speakers however that the real magic happens. I don’t quite know how to put it, but imaging is very precise yet very relaxed at the same time. There’s an incredibly vivid layering back to front as well as left to right, yet images are not nailed to the stage, rather they sort of float in space, but without being themselves blurry or otherwise imprecise. Low level detailing is really fantastic, even when playing really softly: all the sounds are there with Retina-like resolution in all their harmonic glory. This particular area impresses me most of all, and it is here that the Mingus Quintets most obviously outperform any ribbon tweeter that I have heard so far, and that includes my own two sets of Apogees (Divas and Duetta sigs) as well as the Magnepan MG3.6R‘s. The woofers utilise an aluminium honeycomb sandwich and protrude outward, to make for a very nice, clean look. Did I mention that these speakers are also very forgiving? But don’t be fooled: a bad recording is not made to be any better than it is, but rather than sound ear-piercing, it will simply sound uninspiring. These speakers will never punish a person for playing mediocre recordings, but they sure reward playing the best you have. Importantly, they don’t sound witheld, soft or compressed either. 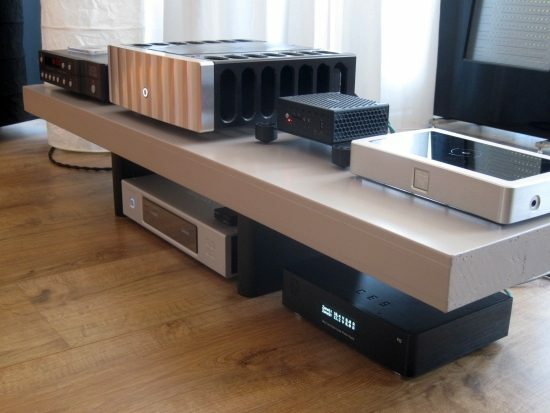 Left to right: Bricasti M1 DAC, Jeff Rowland model 625 s2 power amp, Euphony Buggy/Zotac music server and Exogal Comet. 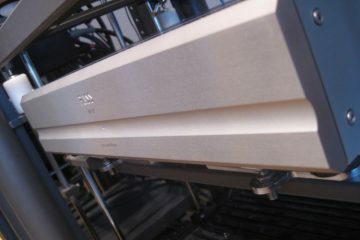 On the bottom is the Aurender N10 music server and the linear power supply for the Euphony server. The Bricasti has a sound similar to the inherent character of the Martens and Jorma cables: smooth, seductive, relaxed yet highly detailed. In this setup however I preferred the more upbeat and more spritely sound of the Exogal. From the available music servers and streaming endpoints I found the Aurender to be the best match. Its ability to extract the most detail and sound airy and refined at the same time matched best in this setup. I’ve left the bass for last, but fear not: this area is also handled extremely well. The trouble is that I have heard the Coltrane 3 at Hans’ place just before I set up the Mingus Quintet in my listening room, and that kind of spoils a man. The Coltranes are a little speedier and transparent and their incredible coherence is not entirely equalled by the Mingus Quintet. That said I am not 100% sure that I have heard the best from these speakers in my room just yet. I have also heard these speakers at an audio show using the same electronics and from memory they sounded more similar to the Coltranes than I would say now. Room-speaker interaction really is not to be under-estimated, and I am aware that my room has some issues. Setting up any speaker for best bass performance takes patience and good room support, or rather lack thereof. Putting this into context, the Mingus Quintets need more care finding the precise position for best bass performance than Apogee Divas or Duetta Signatures, but rather less than the B&W 800D’s or the Kharma 3.2’s. Taking time to try every wall in the room and then carefully tweaking their positions really pays divident with all speakers and the Martens are no exception. The Mingus Quintents need plenty of space to the sides and rear whereas the Coltranes seemed content in a very narrow room. Get it right though and the Mingus Quintets reward with surprisingly deep and seriously sturdy and sonorous bass. Most listening was done using the Jorma no.3 speaker cable and Cardas Clear XLR interlink. On the carpet the Jorma Origo speaker cables and interlink are waiting to be connected. Bass level can be adjusted in three steps: +1, 0 and -1dB. While the image shows the switch in the -1 position, I used them in the neutral position. For the majority of the listening tests, I used the Cardas Clear XLR cable and the Jorma no.3 speaker cable. 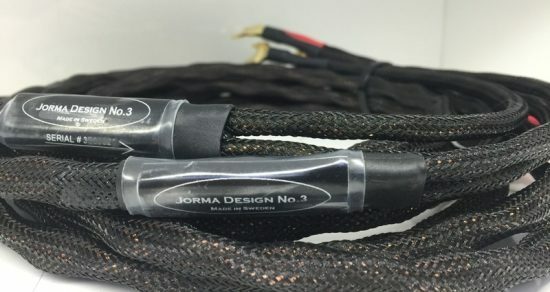 The no.3 is Jorma’s most affordable speaker cable, a seemingly simple cable but inside they have a similarly complex internal structure as the more expensive cables in Jorma’s lineup. When handling and connecting it you can feel that this is no ordinary cable. It may look simple, but it feels heavy, supple and luxurious. 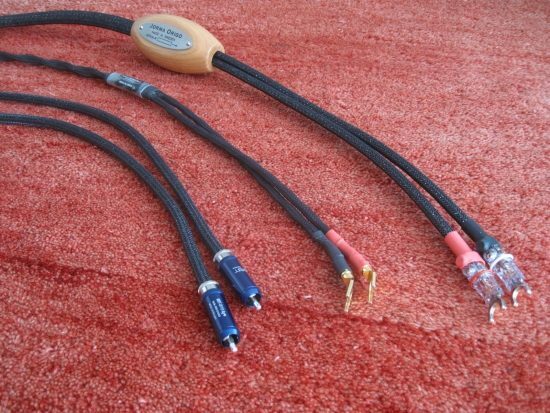 The Cardas interlink was used mainly because I know it well, and because it is an XLR cable, while the Jorma Origo that Hans provided was a cinch cable. 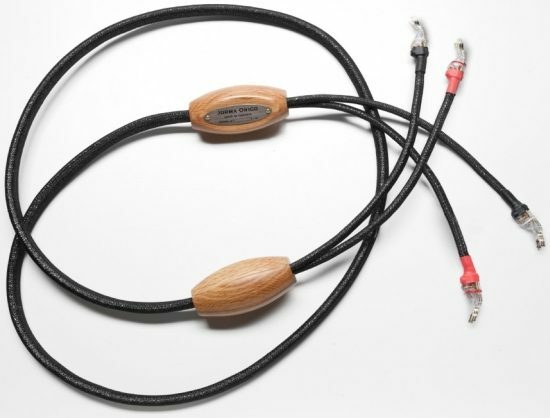 Speaker cables, until now, were the Jorma no.3. Listening to the system this way, I get the feeling that the Jorma no.3 speaker cable’s sound is superbly refined and natural, and apparently a very good match for these speakers, which use the same brand of cable on the inside. Without direct comparisons to other cables, I can’t point out any attributes in the sound that could be caused, or left out, by the cables. That is, until you connect the much dearer Jorma Origo speaker cables. The Origo sounds fuller, calmer, more organic and relaxed and smoother than the no.3. At the same time it does not let go of the slightest amount of detailing or transparency compared to the already splendid no.3. If I were to point out any difference that may be an opinion divider then it would be the perceived speed difference between the two cables. The no.3 sounds comparatively quite a bit leaner but it is also undeniably a highly enthusiastic cable whereas the Origo tends to be calmer and riper. It’s really much like young wine versus aged wine, both interesting, but for different reasons. 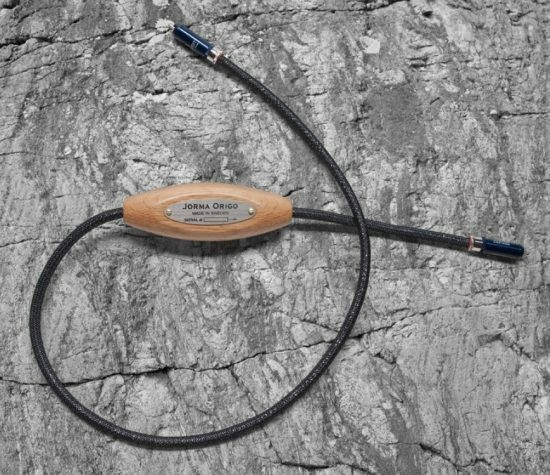 When comparing the Cardas and Jorma interlinks, it strikes me how much the Jorma cable has in common with the Marten speakers. The Origo cinch interlink sounds incredibly detailed and neutral, and highly organic and natural, but simultaneously decidedly non-edgy, without adding any thickening or dynamic-damping effect as often happens with such relaxed sounding cables. In comparison the Cardas has the brand-typical character which adds some presence to the upper bass and lower midrange which is definitely not unpleasant, and arguably subjectively a little bit more energetic, but apparently perhaps not entirely neutral. The Origo interlink is clearly something special. Almost unspectacular, it leaves nothing out and just moves out of the way to let the music speak for itself. Listen to it for a while and then try to replace it with a lesser cable, and you will likely not be happy. The Origo speaker cables have a similar effect but to an even larger extent. Beware though: although the relatively affordable no.3’s leave absolutely nothing to be desired when listening to the Mingus Quintets, it is hard to go back to them after having listened to the Origo. Luxury grows on a person very, very quickly. These speakers really are something special. They’re clear, open and dynamic but also lusciously smooth and relaxed, with a highly convincing natural tonality and deep, powerful bass. Despite being superbly detailed and having incredible low level detailing, they don’t have that “hifi” in-your-face sound. There are other speakers that also sound very detailed, but I have never heard a dynamic speaker (with or without ribbon tweeters) that has such incredibly clear-cut, yet so utterly fluid and refined treble and midrange. Jorma cables seem to be a perfect match for these speakers, complimenting their strong sides while adding no character of their own. 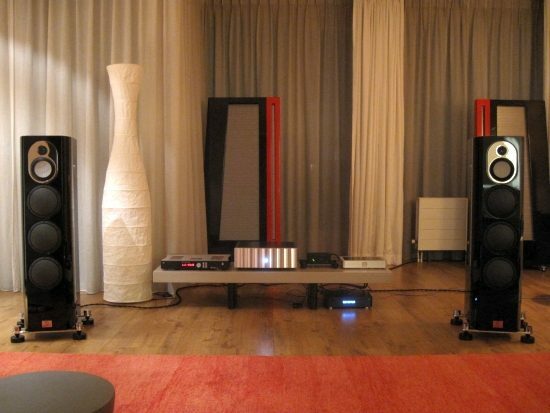 Thank you for your very nice review of the Marten Design Mingus Quintet loudspeakers. 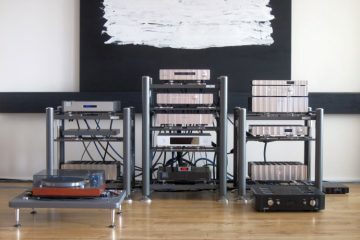 In my opinion the first important thing you forgot to mention is that you reviewed the Mingus Quintet using a kind of “budget type“ of interlink and speaker cables compared to that of the set of H van Put, that is equipped with the very expensive Jorma Design Statement interlink and speaker cables. 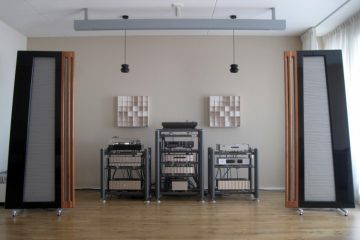 Second, the set of H. van Put is equipped with a 12K Euro Stillpoints ESS rack, probably good enough to shame your Artesania Exoteryc rack. In your reviews you say that everything matters. So differences in sound quality between your set and that of H. van Put is not only in the speakers but certainly also in the rack and cables etc. 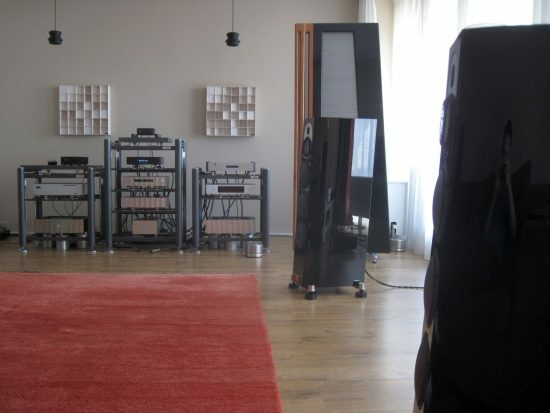 The quality of the ESS rack and Statemant cables used by H. van Put spoil a man too…. I understand your point. 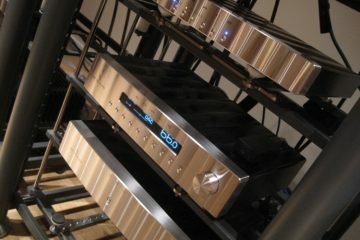 But why would you assume that the ESS rack would put the Exoteryc rack to shame? They are certainly different but both employ a pendular principle. If you’d set them up side by side for a comparison I’d imagine that they are both very good, but just different. Different enough to explain my admiration for the Coltranes? I don’t believe so. The Exoteryc is ~7k, the ESS is ~12 k, so it must be better? While this is definitely an indicator, I have found that higher prices are not always synonymous with better quality. Above a certain price point often it means some aspects are better and others just different, not necessarily better. 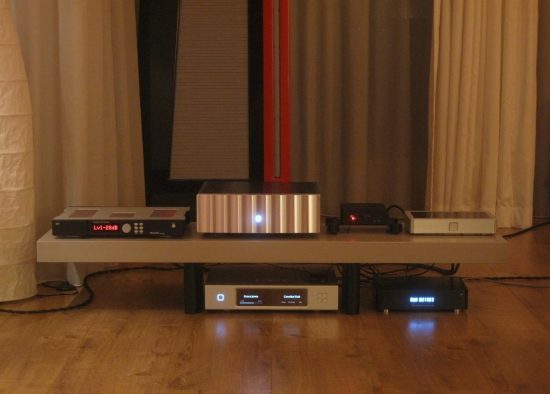 It may have gone unnoticed but besides the entry-level no.3 cables (still 1600 euro) I also had Jorma Origo interlink and speaker cables at hand which are hardly entry level. While these certainly made for a big change in sound, they do not make Coltranes out of the Mingus Quintets. You are right in reminding me of my own mantra that everything matters for the eventual balance. One cannot compare one system in one room to another in another room an absolute sense. 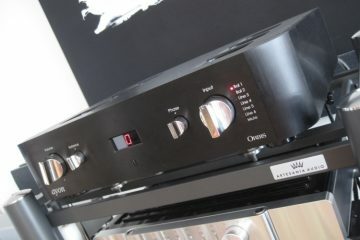 But I know the DAC, preamp and power amps that Hans uses very well. Although the setup and positioning at his place absolutely add up to the end result, the main differences that I observed between the Coltrane and Mingus Quintet are coherence and bass quality, which I’m quite sure can be traced to the quality of the speakers themselves, not to a better room placement or system match. But you’re right – I can’t be sure. In closing, while the wrong match can definitely ruin the end result, in general, I don’t feel that it is required to use the most expensive cables to be able to judge the overall quality of speakers or a piece of audio equipment. The most important factor for this is to use products with well-known properties. As I have used the No.3 for very many reviews I can say with certainty that while it may not sound as creamy-rich as some other cables, it is highly refined, very neutral and well-balanced, and will never impose any character of its own on the sound. I agree with you that more expensive is not always better. 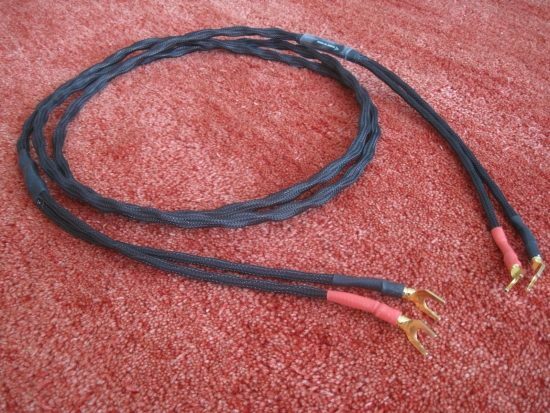 However I can tell from personal experience that the Jorma Design Statement cables are much better than the not cheap Prime version, let alone the lower versions. In my opinion looked at from a price point of view 24K Euro for a few meters of speaker cable reduces many other cables to “budget cables”. It is no coincidence that the Mingus Supreme Edition is available, being a special more expensive version of the Mingus Quintet that has the Jorma Design Statement cables inside. But still cheaper than the Coltrane 3. Speaking of big money, the same is valid for your upgrade of the standard power supply to the 12K Euro PSU for your Jeff Rowland Corus pre-amplifier. Here the PSU and price make the difference. Fair enough. Many things are relative, but you’re quite right about the PSU: expensive, but making an enormous difference with the Corus. 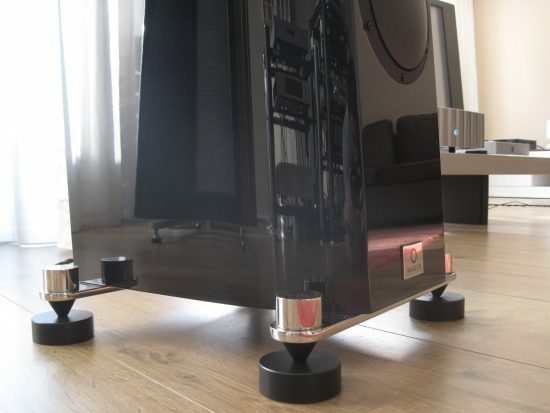 The current trend for 3 woofers – maybe the slight issue you are hearing in the bass region is due to the compromises with crossing at 370hz first order. The lower bass unit is a fair distance away from the 5″ cell, handling some midrange frequencies. Just a thought. 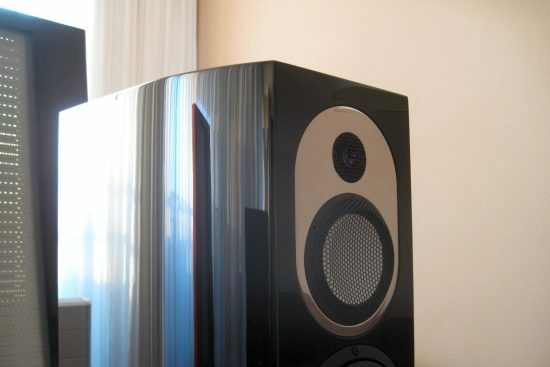 Maybe this is indeed a factor, but I think it had more to do with their bass reflex ports exciting the room modes that I had at that time, to a much more serious level than other speakers did before that. I’ve also heard this speaker elsewhere at demo’s, having very tight bass. So, its design may be more critical, but you can get it right. BTW I noticed similar issues with the Wilson Watt/Puppy 8, although, in my room at least, these tend to sound subjectively more articulate in the bass, but inducing considerable room modes nevertheless. 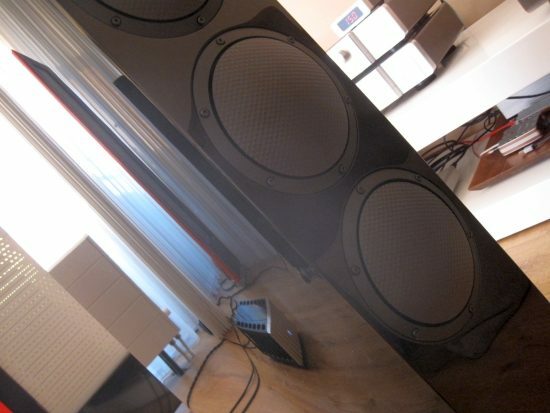 I have since fixed this with different speaker placement and a bunch of big bass traps, see the AcousticMatters review.